World War II was the largest and deadliest war in history. England alone was home to almost 30 military airfields. What was it like growing up in an England that was covered in airbases and focused solely on the war effort? Dame Elisabeth Frink (1930-1993) was not quite nine years old when the War shattered the calm of her English countryside home. Raised near an airbase in Suffolk, she experienced horses and birds of prey side-by-side with crashing airplanes and machine gun fire. These birds of prey would feature prominently in the prints she created throughout her career. According to Frink she “used birds as a vehicle for all sorts of aggressive forms… They became likes bits of shrapnel and flight things, you know, with very sharp beaks”. The prints featured in the exhibition Elisabeth Frink: Mountain Hawks & Other Creatures, represent a period in Frink’s work, starting in the mid-1960s, when her tone began to shift away from the chaos of her earlier work - work that was born out of the War’s immediate impact on her - to focus on her deepening concern for the relationship between human beings and the natural world. Elisabeth Frink: Mountain Hawks & Other Creatures continues until May 24, 2019 in the Dubois Gallery, Maginnes Hall on the 2nd and 3rd floors. Hours are Monday through Friday 9 AM – 10 PM. 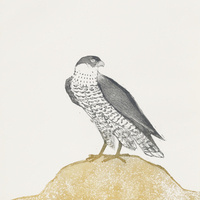 Image credit: Elisabeth Frink, Peregrine Falcon, from the series Birds of Prey, 1974, etching, aquatint, and lithograph on paper.